Añadir campos adicionales al administrador de artículos desde el backend. Añadir campos adicionales al editor de artículos en el front-end. Almacenamiento de los valores de los campos personalizados en una tabla de la base de datos. Conversión de los valores de los campo en una tabla HTML que se inyecta en el artículo mostrado. Una capacidad que está presente pero no se demuestra, es la integración de los valores de los campos personalizados en otros componentes y vistas, tales como listas de artículos o blog de categorías. Este ejemplo agrega valoraciones de comida a los artículos. Estas valoraciones consisten en la textura, temperatura y sabor. Cuando están presentes, se muestran como una tabla simple. Esta tabla se mostrará antes del contenido del artículo. Un ejemplo de cómo el plugin coloca la tabla al comienzo de un artículo. El ajuste de los valores de estos campos se puede realizar tanto desde el backend como desde el frontend. Within Joomla, the article manager is basically a form driven component. Both in the backend as the frontend. When handling a form, the framework performs the following actions. Loads the form description. This is a XML structure. Loads the data from the user state if present, and if not from the database. Renders/displays the form for the user to work on. Validates the data against the form description. If validation fails, stores the data in the user state and starts from the beginning. The framework has placeholders for all these moments. This example plugin will hook into these placeholders, expanding the form and data with additional custom fields. Called after loading the article from the database. It will inject the additional fields and their value into the article. Called after an article has been successfully stored in database. It will store the additional fields in their designated database table. Called after an article has been deleted (emptying of trash). It will delete the additional fields. Called before the article will be rendered/displayed. It will inject the rating values as a table at the beginning of the article, if values have been entered. The example plugin contains the following files. It has an extra directory rating. The primary reason is that it contains a XML file that is not a manifest. If it were located in the plugin top-level directory, the installer would find it and mistakenly identify it as an orphaned plugin. This would result in the form showing up when ‘Discovering’ lost extensions. A regular plugin manifest which takes an extra configuration argument, a CSS name that is tagged onto the rendered rating table. 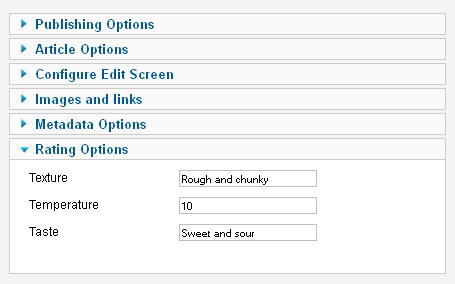 PLG_CONTENT_RATING_XML_DESCRIPTION="[plg_content_rating] Example plugin on how to add custom fields (texture/temperature/taste) to articles (com_content). Adds ratings to an article, and display them as a table before the article content." PLG_CONTENT_RATING_FIELD_TEXTURE_DESC="What does the sample feel like"
PLG_CONTENT_RATING_FIELD_TEMPERATURE_DESC="What is the temperature of the sample"
PLG_CONTENT_RATING_FIELD_TASTE_DESC="How does the sample taste"
PLG_CONTENT_RATING_ITEM_FIELD_RATING_CLASS_DESC="Optional CSS class to add to the rating. This allows CSS styling specific to the page." The CSS file for the rendered table. The form containing the custom fields. The main file ‘rating.php’ contains the hooks which are called by the Joomla framework. The $context parameter is a string identifying the calling placeholder. The $article parameter is an object (JTableContent) representing the article. The constructor. It loads the language file. onContentPrepareForm extends the article manager form in both the front-end as the back-end. It loads the form fragment as described in rating/rating.xml and merges that into the framework form. onContentPrepareData() is executed after an article is loaded from the #__content table. It will gather and merge the values of the custom fields, which are located in the table #__user_profiles. The field articleId in $data contains the article record number. That number is used to retrieve the values of the custom fields. If no record number is present, or it is zero, then a new record is being create. When this occurs, $data gets populated with the default values from the form description xml. It is important that when onContentPrepareData() returns, $data contains the custom fields. This is due to how the framework uses them as place holders. When a user saves a newly created article, and an error situation occurs (like some values are missing) the form data is temporarily stored in the user state. If the place holders are not present, their values will not be preserved. The user will notice this because the custom fields will get erased. // Load the data from the database. onContentAfterSave() is called after the article is stored into the database #__content table. It will extract the values of the custom fields and store them into a separate table. onContentAfterDelete() is called after the article is deleted from the database #__content table. It will delete the linked custom fields which are stored in a separate table. onContentPrepare() is called when the article is being prepared for display. This is the moment where HTML can be injected into what will be displayed. $params are the article params, $this->params are the plugin configuration parameters as described in the manifest.